Successfully Added T95K Pro 4K TV Box - Android 7.1, Octa Core CPU, 3GB RAM, 4K, Dual Band Wi-Fi, Kodi, SPDIF, 32GB Memory, Micro SD Slot to your Shopping Cart. 4K resolutions bring your media to life in rich quality that's simply breathtaking. Android 7.1 OS for an intuitive and user-friendly interface. Amlogic S912 Octa-Core CPU and 3GB of RAM ensure a speedy performance for the most demanding of games and movies. Kodi TV and the Google Play Store offer an endless stream of free viewing and games for you to enjoy. The T95K Pro Android TV box will turn your living room into the ultimate family entertainment zone. With an Octa-Core CPU and 3GB of RAM, this TV box has the power to bring you the latest Android games and a wealth of movies, sports, and TV shows. You can have a dedicated cinematic and gaming hub in your home and enjoy a visual feast with 4K support. With dual-band Wi-Fi, you get fast data rates without needing a wired LAN connection so you have greater freedom when I come to the setup of this TV Box. There is support for optical SPDIF audio that ensures a crisp clear audio quality of without any crackles or distortion from interferences, this adds to the cinematic quality as you can easily hook up this TV box to your sound system. There is 32GB of onboard storage that can be expanded via a micro SD card slot or USB memory pen allowing you to share and copy media from other devices. 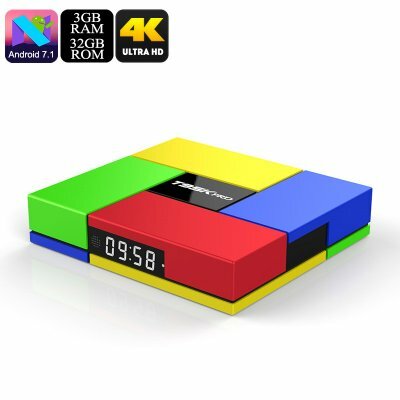 With its unique colorful design, this bright TV box will turn your TV into a smart family computer to entertain and delight. All this and more can be enjoyed from the comfort of your sofa for an amazing price. The T95K Pro Android TV box comes with a 12 months warranty, brought to you by the leader in electronic devices as well as wholesale TV boxes and cool electronic gadgets..